I will be honest. There are many fruits and vegetables that I are intimidating to me because I do not know how to prepare them. One of these is figs. Look at how scary they are. But, I want to try them. Curiousity has gotten the best of me. I’ve seen many of the food blogs I read just put them on top of a bowl of oatmeal, or just on some crackers. What is their texture? How do you prepare them? Beth FS? Friends? Anybody? Beth FS update: I have never purchased or prepared a fig. I do love when someone else has already done the work and made them into a nice jar of jam, which I then spread on the inside of the bread before making a grilled cheese sandwich. I have eaten them in their pure fig form when someone else has done the preparing. They have a somewhat grainy texture, but are really sweet. The most delicious example I can think of is a salad I had at Yellow Springs restaurant The Winds. It was called The Sexiest Salad in the World, and it was their version of this Jamie Oliver salad. 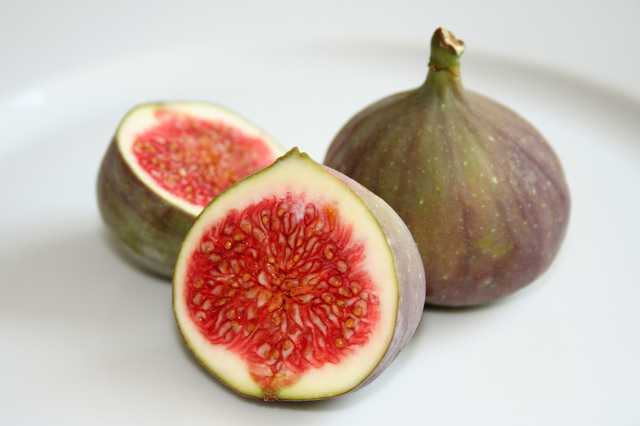 The fig prep seemed simple – just almost quartered – and is explained in Jamie’s recipe. In my mind when I read it, I do so in his lovely British accent.